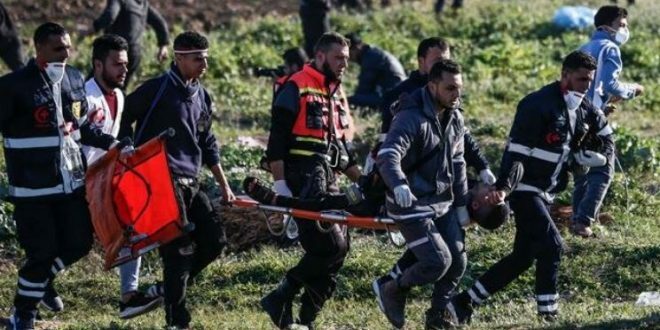 Israeli occupation forces have opened fire on the Palestinians protesting along the fence that separates the besieged Gaza Strip and the Israeli-occupied territories, killing two and injuring 55 others. Israeli forces stationed along Gaza-Israel borders opened live fire and fired a barrage of tear gas canisters at Palestinian protesters who gathered on Friday to partake in the Great March of Return protests at the encampments east al-Bureij refugee camp, in the central Gaza Strip, shooting and killing an 18-year-old Palestinian. A number of medical personnel suffered from tear gas suffocation to the east of al-Bureij and an ambulance belonging to the Palestinian Red Crescent Society was attacked and damaged east of Gaza City after being hit by tear gas and sound bombs. The latest Israeli killings came in defiance of a United Nations (UN) condemnation of Israel’s use of “unlawful force” against the protesters in Gaza. Earlier on Friday, the UN’s Human Rights Council had denounced Israel’s use of “unlawful lethal and other excessive force” against unarmed Gazan protesters. The resolution was based on a UN Independent Commission of Inquiry report that found that Israeli forces had committed violations of international human rights and humanitarian law that “may constitute war crimes or crimes against humanity” in killing 189 Palestinians and injuring thousands between March 30 and December 31, 2018. Khraishi said 35 children, two journalists, and an unspecified number of medical workers had been among those killed during the period of inquiry. The protests in Gaza reached their peak on May 14, 2018, the eve of the 70th anniversary of Nakba Day, or the Day of Catastrophe, which coincided that year with the United States’ relocation of its embassy from Tel Aviv to the occupied Jerusalem.